The summer of Valiant keeps on sizzling with a new & exciting series! Obadiah Archer, born & raised in an order of religious zealots who believe in the coming of The Dominion, a type of rapture. Trained in a multitude of self defence & martial arts, Obadiah is sent on mission by his parents to eliminate the one man who they believe can stand in the way of The Dominion… an immortal brute of a man called Armstrong. Written by Fred Van Lente (Chaos War, Hulk : Season 1), illustrated by Clayton Henry (Exiles Vol.16 : Starting Over) & coloured by Matt Milla. 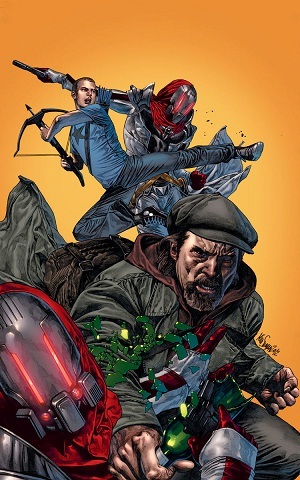 Published by Valiant Comics. This was a fun read filled with action and humour. Having never read the original series from Valiant, I went into this first issue with zero expectations and was pleasantly surprised by what I just read. Van Lente has crafted some interesting characters that seemed destined for future madcap adventures. With Archer (who looks like Eminem), you have a young man, a little wet behind the ears and trained to fight in the name of a sect to prepare for the ultimate battle. Then you have Armstrong, a big, larger than life immortal, who’s also a drunk who likes to party & brawl. He’s got a presence like The Thing from the Fantastic Four who tosses people like rag dolls. Together, these two individuals have captured my interest and I’ve got a feeling that this will be a fine series. Henry’s illustrations are a true delight, with wild fight scenes and detailed facial expressions that shine with every panel. The panels with the zoomed in definitions of Archer’s fighting styles & special talents were a nice touch. Now of course this was only the first issue, but I thought it was terrific and I look forward to future issues.